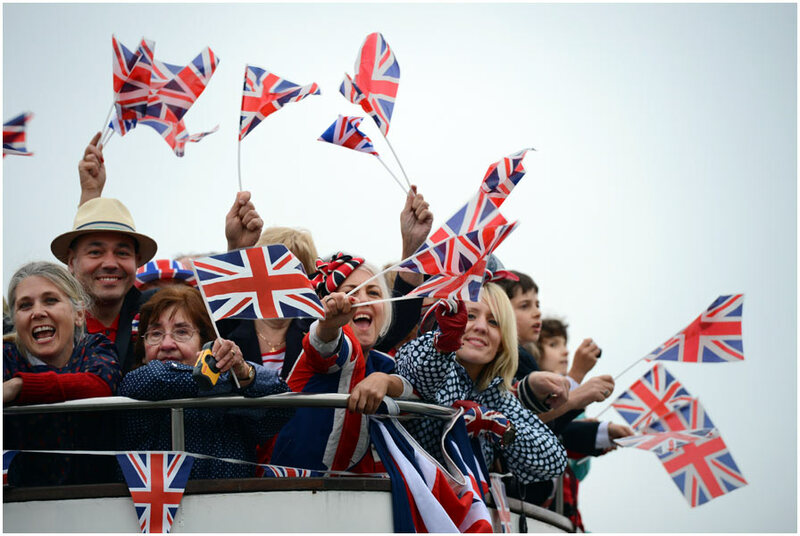 Three days on and I’m now recovered from what felt like one long – albeit only four-day long – extravaganza: The Queen’s Diamond Jubilee celebrations. Recovered, but still not quite dried out! For more than a week before it had seemed as though everybody was checking the weather forecast and wearing a pained expression. Middle of June, nothing but rain on the radar…….. 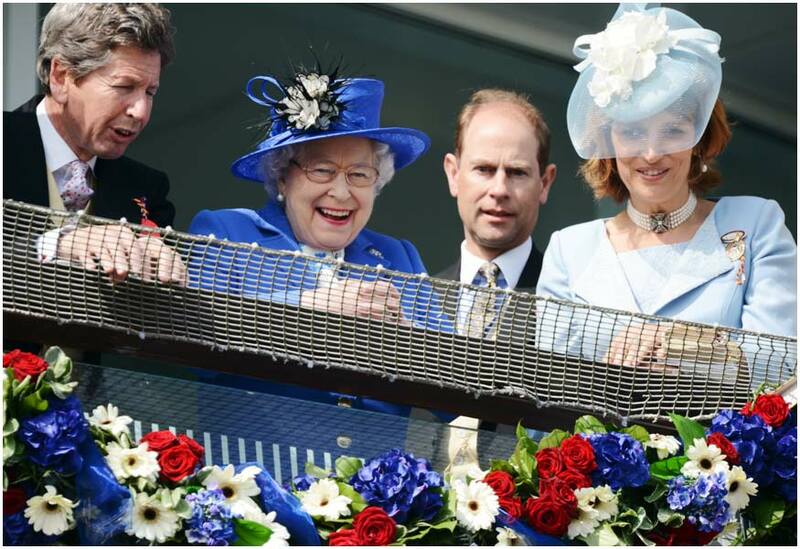 Her Majesty began the official celebrations at Epsom for the annual running of The Derby. We always cover The Derby although due to the increased interest this year we trebled our manpower for the world’s oldest horse race. The Derby was first run in 1780, although I don’t think AFP covered that one! Colleagues Ben Stansall and Carl Court were assigned to photograph the Royals, I took care of the sporting action in Britain’s richest horse race. Saturday morning and surprise, surprise the sun is out! Always a bonus not getting wet while working as is not breaking any camera gear before the job actually begins. 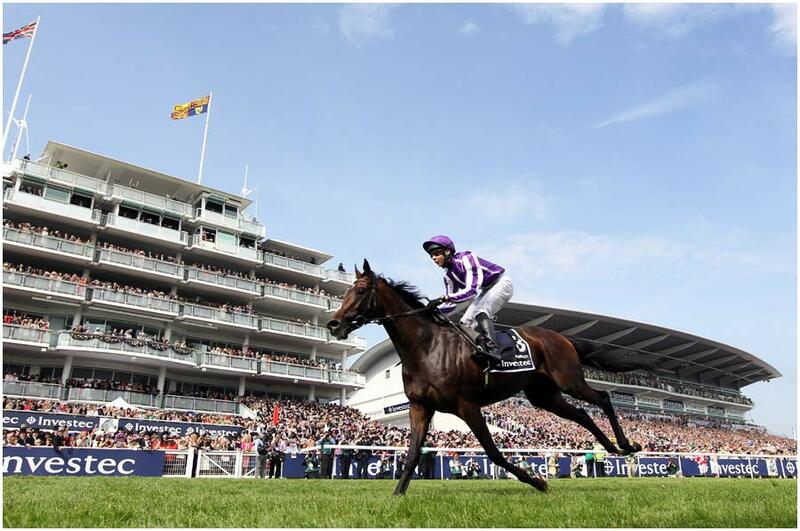 This year drew thousands of race goers sporting Union Flags lining the home straight and Royal Enclosures. While I spent the first few hours wandering around “doing” features I kept an eye on the Queen in the parade ring before the big race. Even though I had been assigned the sporting action of the day I knew that anything the Queen did on this particular Derby Day would overshadow the race itself. 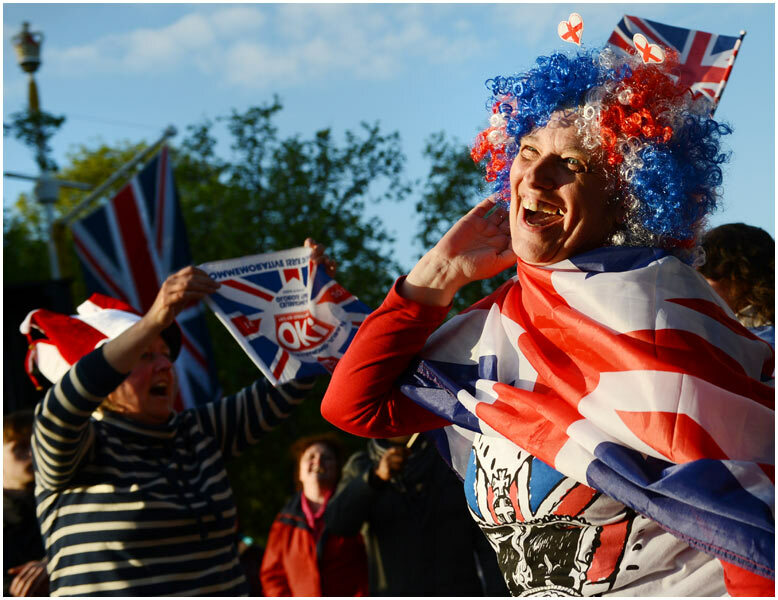 With a few hundred frames of patriotic punters and Her Majesty smiling while looking at horses, one of her favourite pastimes, I headed off to find the photo editor, Dan Sorabji, to drop my early pictures. We’re off to a flyer! Joseph O’Brien rode to victory on race favourite Camelot. The nineteen year-old jockey, son of trainer Aidan O’Brien, rode an ice-cool race to become the first father/son, trainer/jockey to land the big race. A good story for the sports pages, but I knew Sunday’s newspapers were going to be all about the Queen. Towards the end of the procession, we persuaded our boat’s captain to join the flotilla and do a “flypast” alongside the Queen’s barge. 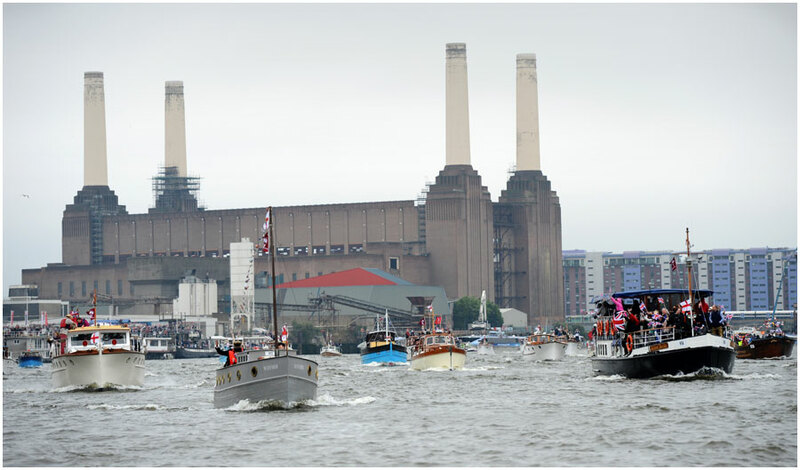 With nine photographers, each with long telephoto lens primed, we sailed down river close to the Queen. 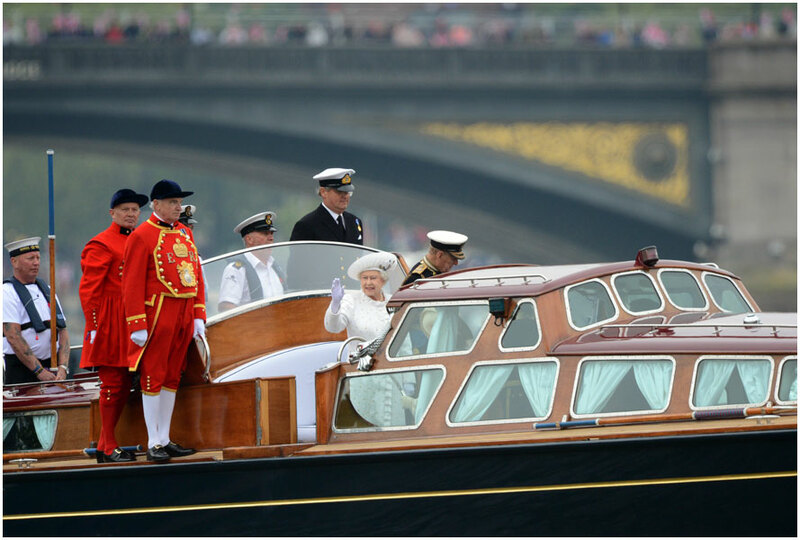 I’m convinced Prince William and Prince Harry were smirking behind the Queen as our little white motorboat joined the squadron of classic boats while I could see a look of what I’m sure was disgust on Her Majesty’s face! Eventually we were dropped off on a deserted and locked pier, way past Tower Bridge, and the race was on to begin editing and transmitting pictures. Funnily enough there seems to be a shortage of trendy East London coffee shops. The only establishment available was a moored barge converted into a bar. We lugged our sopping wet gear on board and plonked ourselves down in the middle of a packed bar with a karaoke afternoon session in mid flow. The MC joked that the talent scouts had arrived and much banter went back and forth. We had soon outstayed our welcome though and within ten minutes the atmosphere had turned nasty. The bar owner took the microphone and to a backing song of “Hungry Like the Wolf” he was shouting: “Why don’t you all F**k Off, coming in here, dumping your gear down……!” We were heavily outnumbered, in Southeast London, it was time to go. But I did laugh at the sight of one of our gang trundling along the street with thousands of pounds worth of wet camera equipment loaded into an abandoned shopping trolley. Classic! By Monday, the pressure was off me. 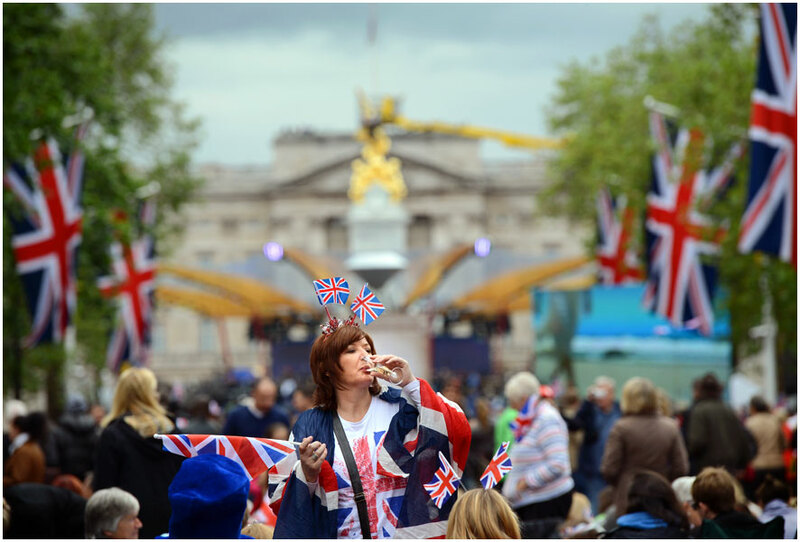 I simply had to go and mingle with the royalists lining The Mall waiting to see the evening concert and shoot features. Surprisingly I enjoyed being among the crowd and chatting to people. I do wonder though what makes people want to stand in the road for hours, if not days, in the hope of catching a glimpse of a pop star or member of the Royal Family. But we’re all different. Home at 11pm, my wife re-heating my roast chicken dinner in the microwave and every kind of lithium battery sitting on different chargers in the kitchen. I needed to be away at 5am the next day. But the final day is in sight. Hurrah! An early morning rendezvous in front of Buckingham Palace and I heaved my Peli case up several flights of steps to the top of a bleacher overlooking the Queen Victoria Memorial. At eye-level with the crowns on top of the flag poles in front of the Palace it really was quite a unique view. My “money shot” was quite simple: a wide angle view of the Queen returning in her carriage after the service at St. Paul’s, followed later with a general view of the thousands of people crowding in front of the Palace as she waves from the balcony. I had several hours to deliberate and chose a position to clamp a camera with a remote trigger onto the railing. Do I include the crown and flag pole in the frame or not? Occasionally having too much time sows seeds of doubt. I picked a spot for the remote to double my chances and sat and waited. Six hours later, we’re getting close; the Queen is on her way back. I can see it all playing out on a huge screen placed beside the Palace. Hmmm, is that camera in the right place – oh no, it’s raining again! Quick, go and wipe the front element, run back and pick up another camera. Bite my finger nails, adjust this, change that. It’s moving fast now! I can’t help thinking it will all be over soon………. The Open this year at St. Andrews was a tale of extremes. The photographers experienced all kinds of different scenarios. Of course playing golf beside the sea in Scotland always throws up challenges, this year we had pouring rain, extreme wind and the occasional moments of “golden light”. 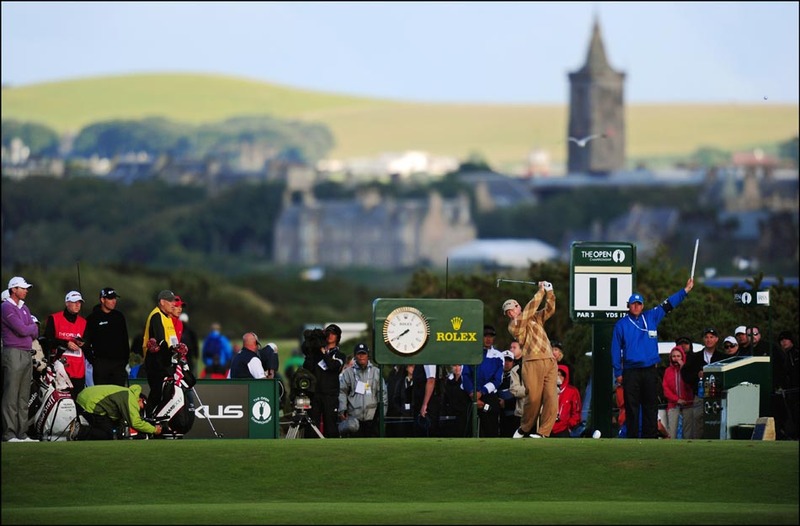 But St. Andrews is one of the harder golf tournaments to cover. It’s extremely physical in terms of the distance we walk. It’s more or less 9 holes in one direction and 9 holes back. The messenger who runs our disks back to the editors looked so tired, collecting a patchwork of blisters on his feet! The old course shares some of its greens, giving us guys a few problems. We’re unable to get too close and move around the perimeter of the green so you’re not going to get many putting pictures. This is where the players react and have great expressions. However, when the play was suspended because of the wind it opened up other possibilities for photos. The players all crowded into mini-vans beside the course, a caddie sitting on a course marker drying his socks caught my eye! We’re always looking for something to sum up the story. Another difficulty is there’s only a few places to cross the course, so planning is important at the beginning of the day. My company, AFP, uses three photographers to cover the tournament and we have to make sure we get something on all the leaders, not to mention the big names like Mickelson, Ishikawa, Tom Watson and of course Mr. Tiger Woods. The competition did end in our favour however. Because the weather played such an important part over the last few days, it became obvious the eventual winner was going to come from the final couple of groups. South African Louis Oosthuizen kept a cool head and went on to win by seven shots. It’s good to see another new face win a major, but there wasn’t too much reaction on his part. Photographers are always willing the player jump in the air, throw his club or go down on one knee but this year we had to settle for a brief wave to the crowd followed by a hug from his wife. Oh well, another Open passes – my third at St. Andrews. I’m starting to turn my attentions to the Ryder Cup now, I’m hoping for more “golden light”, less rain, however I’m sure there’ll be more reaction! I was undertaking my annual pilgrimage this week, back at The Open for another year. This time the venue being Royal St. Georges in Kent. Luckily for me, a mere two hour drive from home instead of the usual ten to somewhere in Scotland. I arrived on the Monday, picked up credentials, said hello to all the familiar faces I see at this yearly event. It only seems like yesterday I was walking past the Swilcan Bridge and down the 18th at St. Andrews. How time flies! 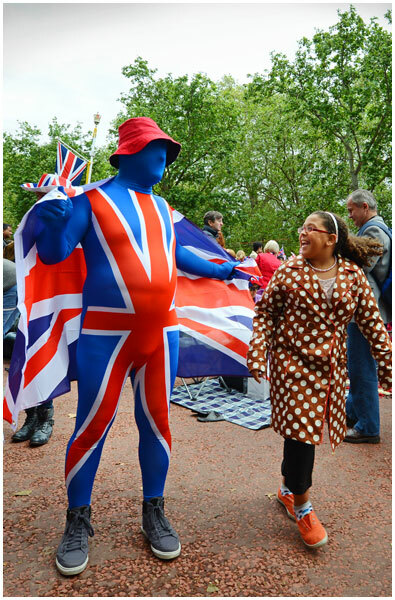 But it seems quicker this time I think – The Ryder Cup in between. I grabbed the course map, I’ll need to commit to memory. A quick walk of some of the holes, a few feature pictures in the “can”, and a quick meeting with the AFP photographers, Glyn and Peter, the two photo editors, Celine and Paul and Simon the messenger and we’re off for another year. I’d covered an Open here back in 2003, some of the signature holes slowly coming back to me. I remember the chimneys! There’s an old power station close to the course and the cooling towers can be placed in the background for a more unusual golf photo to “place” this years’ tournament. I’m trying to find that slightly different angle, hopefully no one else has spotted. This Open was to be slightly different from many of the others I’ve covered. I’m not by any means a veteran, but I’m now into double figures on Opens. I’m slowly getting the hang of it! It’s different this year with the omission of a certain Mr. Tiger Woods. When Tiger plays we assign a photographer to cover his every move on the course. This year the new Messiah is McIlroy. Earlier in the year, Northern Ireland’s Rory McIlroy nearly won the Masters, followed by cruising to victory in the US Open. He’s the man of the moment! The opening day saw McIlroy paired with young American Rickie Fowler and veteran Ernie Els. The decision was easy, I assigned one photographer to follow their whole round. There’s a bit of McIlroy mania happening right now. I chose to “float” around, learn the course, look for different angles, find all important short-cuts to allow me to jump forward and back around the course just in case there’s a surprise leader. But also to keep all our foreign clients happy, I was tracking down the Thai players at 6.30am. We need to get those pictures shot and sent – there’s deadlines to be met somewhere in the world. Golf coverage is a fine balancing act. A mix of photographing past Open and Major champions and well-known foreign players. 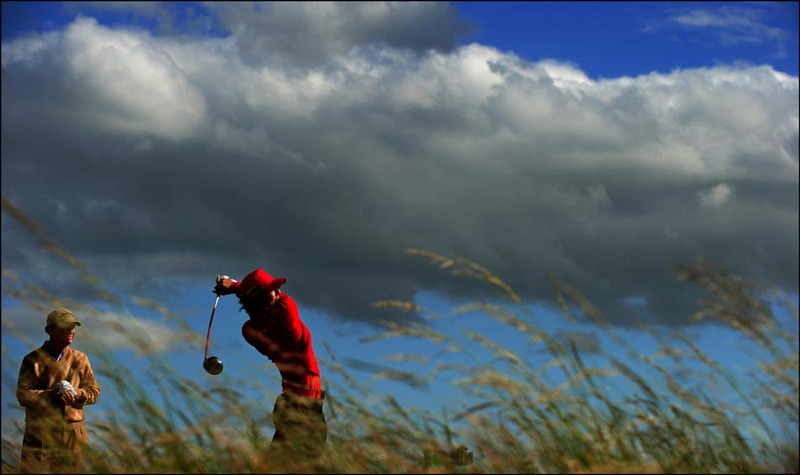 It may take 30 minutes, walking a hole or two to “tick” the box, getting a useable picture of a golfer. They only hit the ball around 70 times a round, a third of which are standard putting pictures. The photographers cover a fair few miles every day, although we have an inside corridor beside the ropes in front of the public we’re still trudging through the long and sometimes sodden grass. It would be a guess, but we must do upwards of eight miles per day usually carrying two or three cameras and lenses coupled with bending on one knee every time you stop to make a photograph. It’s hard on the body! Three days later my muscles are still sore but the pain of the blisters on my feet has eased. It’s a hard life but someone has to do it! But it was all making for a great tournament. Thomas Bjorn who so nearly won in 2003 was on the leaderboard along with some of the let’s say, “more experienced golfers” – Miguel Angel Jimenez, Tom Watson and Darren Clarke. But there was also an amateur in there too, England’s Tom Lewis. The writers would be busy! The M & M’s, McIlroy and MacDowell had rolled off the board and were replaced with another Northern Irishman, Darren Clarke. “He’ll blow up”, was most people’s assessment. “Watch out for Kaymer or Mickelson”. But the rain came Saturday – mostly sideways. A struggle to keep the lenses and viewfinders dry. Chamois leathers working overtime. But at least it’ll sort out the leaderboard. A Monday playoff isn’t everybody’s cup of tea! After the rain, he was still there Sunday. Clarke had a one shot lead and would be in the last group to tee off. Could he hang on? A lot of people were now tipping Fowler after his great round in the bad weather the day before. But at least we knew the winner should come from the last five groups. A plan was made and the three of us shared out the groups and headed onto the course. The trick is knowing when to stay with a group, most of our work was done between the 6th green and the 3rd tee. It was soon clear Mickelson was on a charge, but don’t rule out Dustin Johnson to sneak in too. Talking over our radios we tweaked our plan. Two of us were hovering around Clarke, he eagled the 7th, the crowd roared their approval. A small fist pump, a smile came through before gesturing to the crowd to hush ahead of Johnson’s putt. Golf etiquette at its best! The crowd were starting to believe. Another downpour arrived but it didn’t effect Darren, he played on while I was sheltering beneath a spectators’ brolley. It’s not a good time to break a camera now. I continued with him until the 17th before making my way down the gated 18th hole. I needed to be there in advance to take a position to make sure everybody was in place. The plan was set. As soon as he makes his winning putt and lifting the claret jug, the messenger was running with our cards back to the editors. Time is ticking, the papers will be waiting for the pictures. 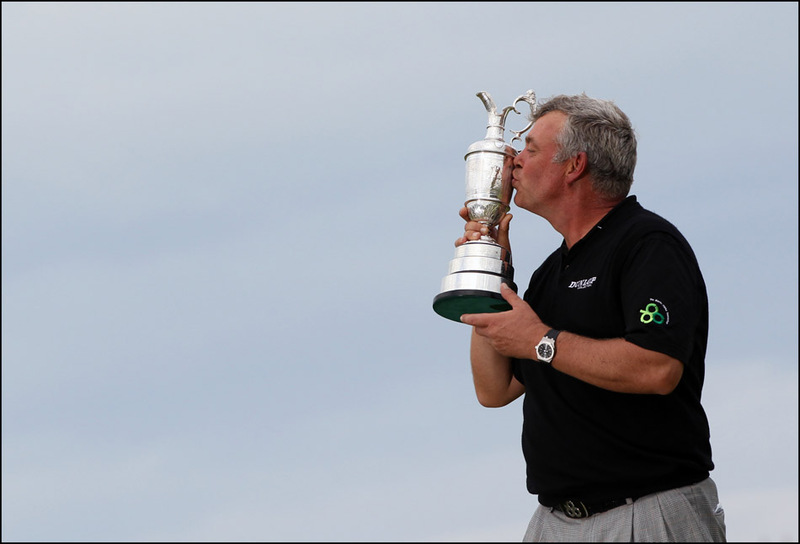 Darren Clarke had won a major. Finally! 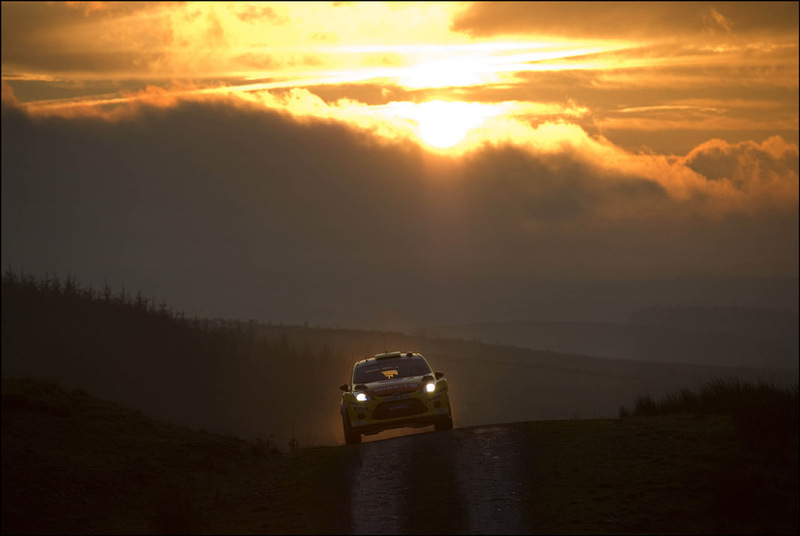 One of my recent assignments was to cover the final stage of The World Rally Championships, although heading to Wales to photograph cars speeding through rain-soaked forest tracks isn’t always the most appealing assignments. Having covered the event before, I reserved a rental car, one with an extra big boot for the equipment and an extra bag of waterproof clothing – Abacus of course! A colleague (Tom Hevezi) and I, set off on route to North Wales, me behind the wheel, Tom navigating. 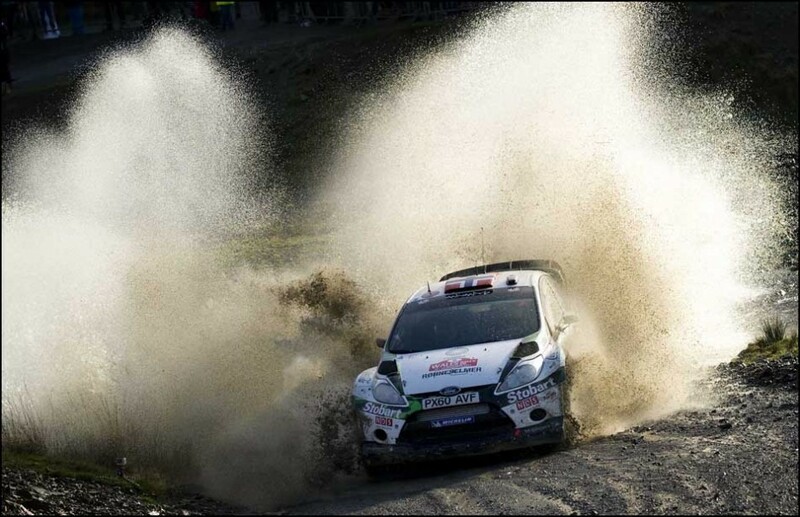 This year the rally began in Llandudno, right on the northern tip of Wales. Upon arrival, we picked up our credentials, signed our lives away and were issued with the stage maps. Without stating the obvious, motorsport can be dangerous, and to get “free rein” for that extra special photograph you have to sign on the dotted line….. the organisers don’t take any responsibility for photographers and in return we have carte-blanche to stand, kneel, hide wherever we want on the course. 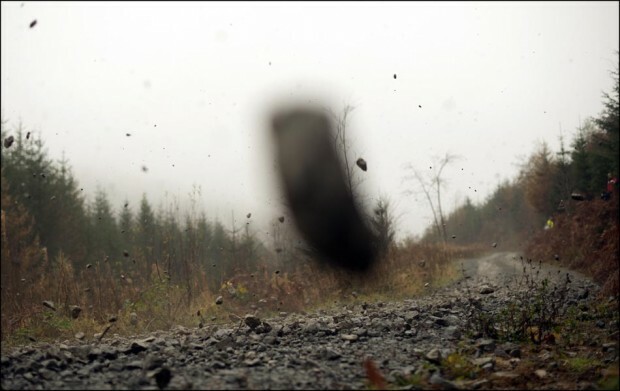 It’s not for the faint-hearted peeking from the hedgerow while a car speeds along a stony road at 80mph. In the dark. The hardest part of the job, apart from getting the car in focus etc etc, is getting to the stages with time to spare to find the “best” or most realistic place to stand. The first day was luxury! 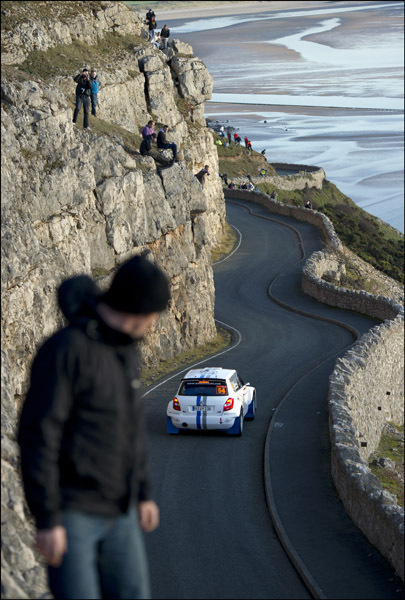 The competitors were racing on The Great Orme, a mountain-hugging road on the coast of North Wales. The sun was shining too. Shock Horror! The biggest problem photographing rallying is the best cars come first, logic similar to horse racing. There’s no chance to experiment with the angles and you only get one chance. Multiple world champion Sebastian Loeb is usually first around the corner. Being a Frenchman, and for me working for AFP (Agence France-Presse), he’s the one I need! I picked my spot, high up on the hillside basking in the sunshine and waited. The rallying fans start to arrive, and like us dared to perch on the edges of rocks looking down on the cars. The chance to wave and cheer their favourite driver makes their day. Others like the brands – Fords, Citroens and the “barking” Minis. Once the racing starts you can hear the cars in the distance, marshals blowing excitedly on their whistles to warn of the impending 300 horsepowered car coming sideways around the bend. The sounds are like none other. The whistles, the engines red-lining, the cars “banging” through the gears and occasionally tyres screeching followed by a uncomfortable sounding crash. It ain’t the way you’d treat your own car. It’s unmistakeable. The real work had begun, we edited our pictures from a small tea house stuffing our mouths with cake while “doing” an edit and a bit of Photoshop on the laptop. The crumbs get in the keys! 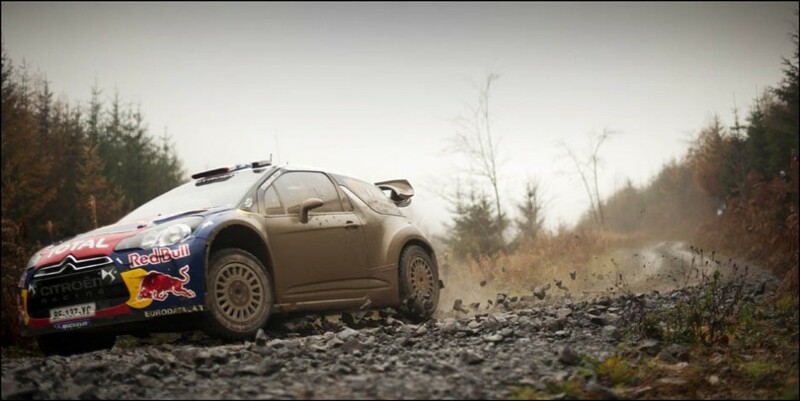 The last competitor was through and back to the car, we needed a phone signal to send the pictures – time was ticking. There’s always a deadline! A two-hour drive to the guesthouse somewhere in Mid Wales beckons, a shower and a glass of beer before bedtime. We needed to be rolling again at 5.30am just to find the stage and take position. Next day was more familiar Wales weather. Rain. Tom navigating, we found the village and drove along a farm track. Flashing our passes and credential we were through a road block and driving into the wilderness. There are no rally fans coming this way. For us, we need to quickly get in and sometimes out to keep up with the rally. Once parked, waterproof clad, I made my way into the forest with 3 cameras. Once in, I knew I wouldn’t be back for a while. I chose my position on a forest track, set up a remote camera and perched myself 4-feet up a bank. I’m on the outside of a slight curve, a bit dangerous, but high enough to hopefully avoid any out of control cars. Always the potential to dive further into the trees if all goes wrong. And I can hear a car, engine whining, Loeb was on his way. I’d been envisioning my picture over the last hour or so – would it work? The remote camera gave me another chance too. And the lead drivers slid their way past kicking up fist-sized stones, some thudding into the mossy bank upon which I’m kneeling. One catches me on the wrist, that’s pretty lucky – if my hand wasn’t there it would have pinged right off my lens barrel. How long can I leave the remote down? After four or five cars (the leaders) I’ve got to retrieve it. It’s a only a matter of time before a rock connects and goodbye camera. Not only that, but the gear was getting splattered by mud. We’d be looking for a chemist later and a big bag of babywipes to clean everything. I knew I’d forget something. Now we had to send the pictures, and that was going to be a problem. I haven’t had a phone signal all day, let alone the necessary 3g signal needed to transmit photos. We’d try our luck and knock at an isolated farmhouse. Luckily the lady obliged, she had wifi. Accepted the offer of a cup of tea, a quick stroke of the dog, but hold on, she can’t remember the network password. We’d have to wait for her son to return home. But it was warm and dry – a good place to edit. But there was a way, there usually is. I managed to log on to a British Telecom network using a separate account I keep. I have two mobile network dongles in my bag to send pictures plus a subscription to BT. It’s frustrating having a good photo if you can’t send it! It paid off. Pictures sent, I’m back out on the rally course and we’re doing it all again. Now it’s dark, the other end of the day. And the process starts all over. Later, after driving 90 minutes we checked into one of the nicest guesthouses I’ve ever had the pleasure. Shame I only had 6 hours to enjoy it. We were leaving early next day. But breakfast was left out, we were happy. Today featured the “Sweet Lamb” stage. It’s a bit of a gimme for photography. All the rally “snappers” congregate – there’s a mega water splash. If that doesn’t “float your boat”, then one of the jumps might do. Plus the sun was out. Nice! We played here, so many different photo possibilities. But so many pictures. Editing would be a slog. We drove away, heading for the nearest mid-size village – one with a phone signal. A jolly nice tea house selected with all the necessities, chair, table, power, coffee, victoria sponge cake. Ahhhh but those pesky crumbs! Another day done and dusted and the end was within sight. One day left. Again, up super early and on the stage by… too early. And it’s cold. We were somewhere in the middle of a moor where the army train. Bullet casings lying around, I found my way into a tin hut to disrobe and put an extra thermal layer on. Some of the hardened rally fans had been sleeping here, beer bottles for evidence and a toilet ñ letís just say not flushed! This time I knew where I wanted to be. Years ago, last time I was here a car rolled about 9 times in front of me. I’m heading back there! But I needed to hike 2km to get there. The cars are coming through at 7.12am. Better get a move on. This time it was a bit disappointing. Nothing rolled, crashed, spun or blew up in front of me. But the sun finally came up. It was pretty. Back to the car and we’re heading for Cardiff and the podium. It’s easy from now. But wait, Sebastian Loeb, rally leader and soon to be World Champion had crashed. Word spread quickly even across the top of a moor in Mid Wales. Do we divert to try and find the car wreck and jeopardise getting to Cardiff? We couldn’t risk it. Luckily, we arrived with plenty of time, marked a spot on the photographersí gallery and waited for the show to begin. This bit always seems to be an anti-climax. We all had a “buzz” from actually getting around another rally without any mishaps, nothing broken, equipment or bodies. Champagne sprayed, shutters click and pictures sent. Before long we were driving back over The Severn Bridge and heading home. Seven hundred miles in the last five days and I was glad to be home. The washing machine would be busy, no chance of the spin cycle keeping me awake. The Ryder Cup trophy is back in European Hands! What a week. One of the hardest assignments to date. The Ryder Cup had a bit of everything and what a finish! 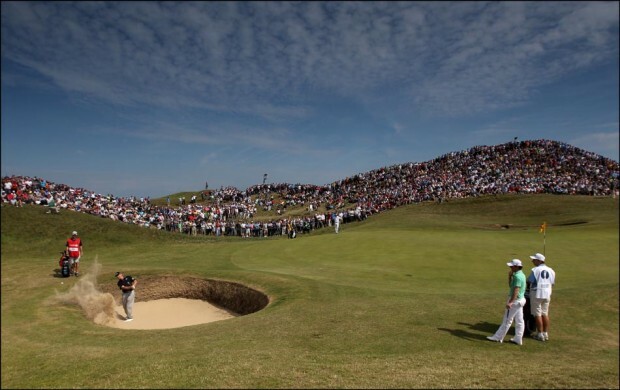 I arrived to cover the golf on the previous Sunday, the first few days spent learning the course, the best angles on the greens and how to make the odd shortcut to avoid those extra few yards. I’m glad I did, one week later my thighs and calf muscles are in pain! The first day of competition came along as well as the rain. And it poured. I went out with the Tiger Woods fourball. We only made it to the fourth fairway before the match was postponed. The golf course was saturated. It was difficult for the golfers and super tough for the photographers. It’s not a good feeling having thousands of pounds of cameras and lenses wrapped in a flimsy waterproof cover. Despite the rain going sideways, I was doing OK, the Abacus gear holding up well. Although the cameras were getting wet and steaming up. I found myself peering through one side of the viewfinder – the part I could actually see through. The drying cloths in my pocket working overtime. Eventually the game was suspended, Europe team Captain Colin Montgomerie sped past in his buggy spraying rainwater from each wheel. I trudged back to the media centre for a cup of coffee. The photographers room was adorned with jackets and trousers. Every possible place to hang an item of clothing was taken. A queue formed in front of the air conditioners, before long the air was thick and humid. The editors were struggling to send the pictures amongst the banter of nearly a hundred or so photographers. Six hours later we were heading out on the course again. The organisers were desperate to finish the matches otherwise we were heading for a Monday finish – the first in Ryder Cup history. During the next two days the schedules were re-jigged amid more rain and we were into Monday. It turned out beautiful, off we went with the singles. Europe needed five points, we’re all trying to predict the ending. You have to be there on the winning putt otherwise no cigar! As the matches developed we thought we’d be looking at one of the Molinari brothers winning so we had a photographer with each group. An American colleague went with Francesco, I chose Edoardo. When I got to the 13th green I began to realize we were going to the wire. All the time trying to adjust our plans using walkie talkies with our team. I ended up on the 18th with Molinari hoping he’d go crazy winning his point. The American Rickie Fowler, won the last three holes and halving the point leaving me stranded at the end of the course. I ran the length of the hole, long lens on shoulder to try and make it back to the 17th to catch the McDowell match. Pushing through the crowd, dripping with sweat I made it to the green before they teed off. I had made it, I lined up in front of McDowell’s ball, however I’d have preferred to be on the other side of the green but it was too late to change. 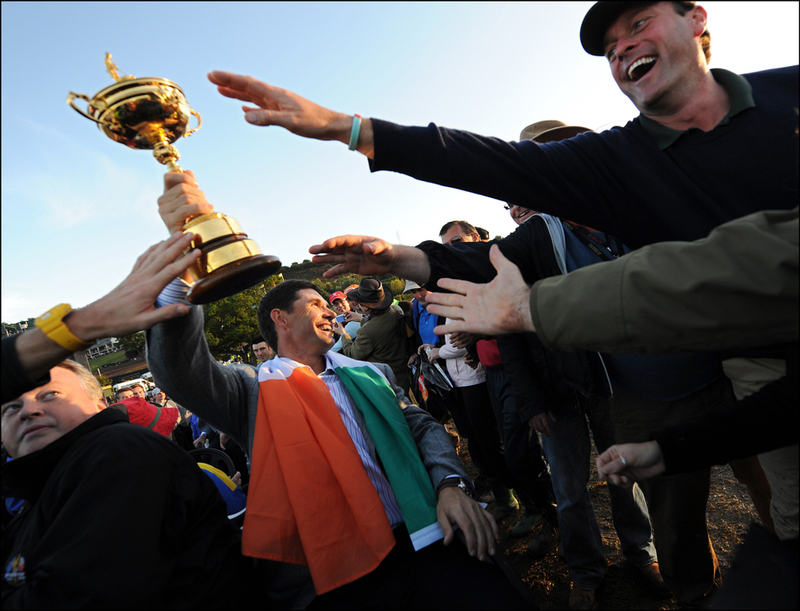 McDowell putted, Mahan conceded and the match and The Ryder Cup was won. Pandemonium ensued as hundreds of fans invaded the green. It was tough to get in. I pushed and squeezed through the fans, there’s no time for politeness on these occasions. I’d never seen a golf green get swallowed by people so quickly. After half an hour or so the celebrations had finished. Still, we had the closing ceremony to do. It wasn’t quite over! My day started at 5 am but our coverage plans started in January. It’s been a long slog, but finally the big day for Prince William, Kate Middleton and the world’s media had arrived! I hadn’t slept well the night before, partly because the central London hotel room was noisy and hot but partly down to my mind racing through a checklist – have I got this cable…. when should I fire that camera, will I be able to edit and send my pictures…. the list goes on. I arrived at my office, put on my suit and tie. Shall I wear my walking boots or wear my smart shoes – it’s going to be a long day standing. Unusually I opted for the shoes and made my way to Westminster Abbey toting two bags and a tripod. 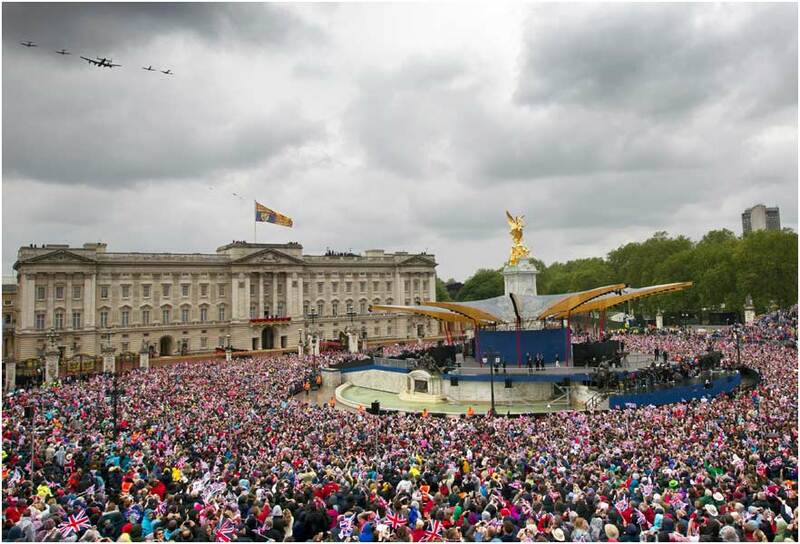 According to reports, more than 8000 journalists were accredited to cover the Royal Wedding, of which there must have been 500+ photographers outside the Abbey, along the procession route and stationed opposite Buckingham Palace. I was one of a small handful of photographers inside the Abbey. I managed to grab a cup of coffee with a few of the other photographers who were assigned various positions inside. We all know each other and are fairly “well-seasoned”. But we all readily admit the butterflies are floating – we were all nervous. After negotiating “airport” style security I took my position on The Abbots Pew, just inside the Great West Door. Various members of The Royal family would arrive culminating with the bride and her father. I’d already composed the picture in my head – Kate and her father would walk past the Tomb of the Unknown Soldier and up the aisle. Nobody knew what her dress was going to look like, but it was going to be spectacular. I had only a few seconds to capture it all, so for insurance I set up two cameras on a tripod triggered by remotes. Every time I made a picture, I had two other different versions. Just in case! Five trumpeters in all their finery made their way onto the balcony where I was positioned. A couple of them limbering up blowing air through their lips – like horses shooing a fly. My palms were sweating, one last check of my camera settings – The Queen was due to arrive. Things were starting to happen fast. I did a few wide angle pictures to capture the ambience of the Abbey, I photographed David Beckham and wife Victoria sitting just below, Elton John was opposite. Who else could I pick out from the crowds? All the time telling myself to relax. I’ve being doing this job for 20 years, and occasionally the nerves “jingle and jangle”. But we were nearly there. It’d all be over soon – you get a feeling I can only describe as something like you get on a trip to the dentist. And when the bride arrived it was spectacular. The bells were peeling, her sister rearranged the train of the dress, Kate looked through her veil and smiled at her father. I’m lucky to witness the event – a small moment of British history. A privilege. One of the perks of being a press photographer or photojournalist. Once they had walked past and up the aisle I had a few minutes to download my camera cards and “do” a first edit. I was speedily trying to pick the best pictures and queue them up on my laptop ready to send back to the awaiting editors chomping at the bit in the office. But the minutes whizzed along and it was nearly time to get ready for the “outs”. The money shot! I glanced over to a nearby television monitor I could tell we were getting close. I could see Prince William and Catherine, now The Duke and Duchess of Cambridge, as they walked back out along the aisle. I tracked them with a 300mm lens for as long as I dare before changing to a slightly shorter zoom lens. Also getting ready to shoot the remote camera as they passed the tomb in the floor. I have to admit I was waiting and hoping Kate would place her wedding posy on the tomb – a tradition from previous royal weddings. This would have been good for me and only me. But it didn’t happen, perhaps she forgot or other plans had been made. But it was still a nice picture as the couple passed by Elton John and other guests on their way to see the public camped outside the Abbey. one of our internet cables -specially installed outside so I could send the pictures. The world’s media has a ravenous appetite when it comes to Royal Wedding pictures! Rushing out of the Abbey, a few seconds wasted being interviewed for a television crew! It was beginning to dawn on me just what I’d witnessed. Wow. But I still thought the best moment for me was when she arrived, minutes away from joining Britain’s Royal Family. Outside I eventually found a colleague and a LAN cable, after a few minutes and a few technical problems – a slightly heated conversation with a technician I connected to the internet and my pictures were going. I’d selected 50 frames and sent them “raw” to the office. The editors can deal with it. I gotta run, I need to be on Downing Street as soon as I can – they’re having a street party. And I’m to the next assignment.